St Devote or Devota is the patron saint of Monaco and a very dear figure to the Monegasque throughout the history of the country. 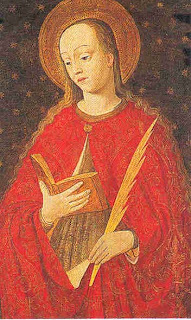 She was a beautiful and extremely pious 16 year old girl from Corsica who was martyred during the persecutions of Emperors Diocletian and Maximian for refusing to worship the pagan gods. Her body was to be burnt but other Christians placed her remains in a boat and put out to sea bound for Africa. On the way, as she predicted, a dove flew out of her mouth and guided the boat to the port of Hercules in Monaco. The boat was dashed against the rocks and the crew drowned but the body of the saint was recovered by some local fishermen and placed in a Christian chapel that was already there devoted to St George. Later a chapel dedicated to her was built and it still stands in Monaco to this day where flowers planted in her honor bloom out of season on her feast day of January 27. It was in 1536 that Lord Honore I of Monaco purchased the expanded and rebuilt chapel of St Devote. Over the years many miracles vital to Monaco and the House of Grimaldi have been attributed to St Devote. When the area was threatened by a Muslim invasion the relics of St Devote were taken to Cimiez monastery but were returned to Monaco in grand style by Prince Antonio I. In 1070 a violent storm at sea foiled a plot to steal the relics, the would-be thief was captured, had his ears and nose cut off and his vessel was burned on the beach. The Monegasque prayed for the intercession of St Devote in 1506 when the Genoese attacked Monaco and she appeared wrapped in a cloud which terrified the Genoese and forced their retreat. The ultimate success of the Monegasque in fighting off these efforts and maintaining their independence was attributed to St Devote. In 1581 when Monaco was attacked by the French and Corsicans, St Devote appeared over the walls and reprimanded the attackers, especially the Corsicans for whom she is also the patron saint, for making war on those who had cared for her relics for so long. The attack failed and St Devote was again hailed as the deliverer of Monaco. St Devote was also credited with ending a plague that broke out in Monaco in 1631 and with ending the Spanish occupation in 1641 after which a captured Spanish galley was renamed in her honor. Prince Honore II had some of the first Monegasque coins minted bear the image of St Devote. In 1924 Prince Louis II began the tradition of setting fire to a boat the night before the feast of St Devote in memory of the thwarting of the effort to steal the relics and a dove is released in honor of the miracle which brought St Devote to the shores of Monaco. The Princely Family and national dignitaries always attend formal services the following day dedicated to St Devote at St Nicholas Cathedral. Every year this service included a formal procession with the relics of St Devote, a blessing of the Princely Palace and all of Monaco and the nearbye sea. Fireworks displays are held in the evening and a formal reception is usually held at the Monte Carlo Opera House. Prince Albert II has carried on this tradition as his father and great-grandfather did before him. St Devote has also been featured on various coins of Monaco as well as on Monaco postage stamps in 1944 and 1992. Pope Sixtus IV was the first pontiff to issue a papal bull granting certain indulgences for the celebration of St Devote's feast and who contribute to the keep of her chapel. Sveta Devota, hvala Ti!Prekrasna si!Marija-Zagreb!Moli za mene i moju kcerkicu! Hvala! Is the Wettin-Grimaldi Match Over? More on Monaco and the "Grey List"